I am a superficial dog lover. I like the pictures on social media and say, “aw, look at the baby,” but I don’t really have the desire to own one at the moment. Everyone loves a cute puppy picture, but there is a tribe of individuals that are dedicated to the wellbeing of dogs everywhere. They sacrifice their time, love, and money to support the animals that have been discarded and abused. 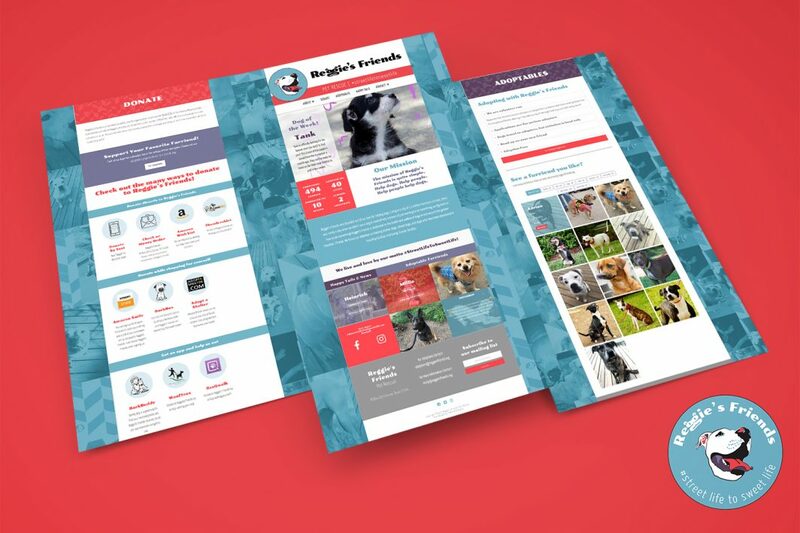 Yes, I am speaking of the pet rescue community and it was my pleasure to work on the Reggie’s Friends Web Design Project. The brand and website were the most obvious way for me to make a lasting impact. It was the perfect opportunity to exercise my problem-solving skills to improve the user experience and overall look of the Reggie’s Friends brand. We started with a logo refresh. It was and still is a jolly depiction of the lovable deaf pitbull that is the rescue’s mascot and first rescue. We replaced the font, Ravie (inner designer voice says YIKES! ), with a cleaner, more modern, yet still retro, funky, and fun font, Poller One. The cutest thing happens when you flip the second g backwards. The reflection of the lowercase g looks like a dog face! The website was blue, the logo was pink and black, and the newsletter was purple—sometimes. Molly and I worked together to find a color palette that would translate across the entire Reggie’s Friends online presence. We chose a color palette that diversified the original pink and black logo to include purple and blue. The homepage should be an opportunity to see what’s new and click on something that peaks your interest. The original homepage only had one link and it led you off of the website to your email client. This made the old site rely heavily on the navigation. My goal was to create a homepage that is always different with minimal effort from my client. The dog of the week is an opportunity for each dog to shine and to help the rescue speed up the adoption process by increasing visibility. This section has to be managed by the rescue every week. 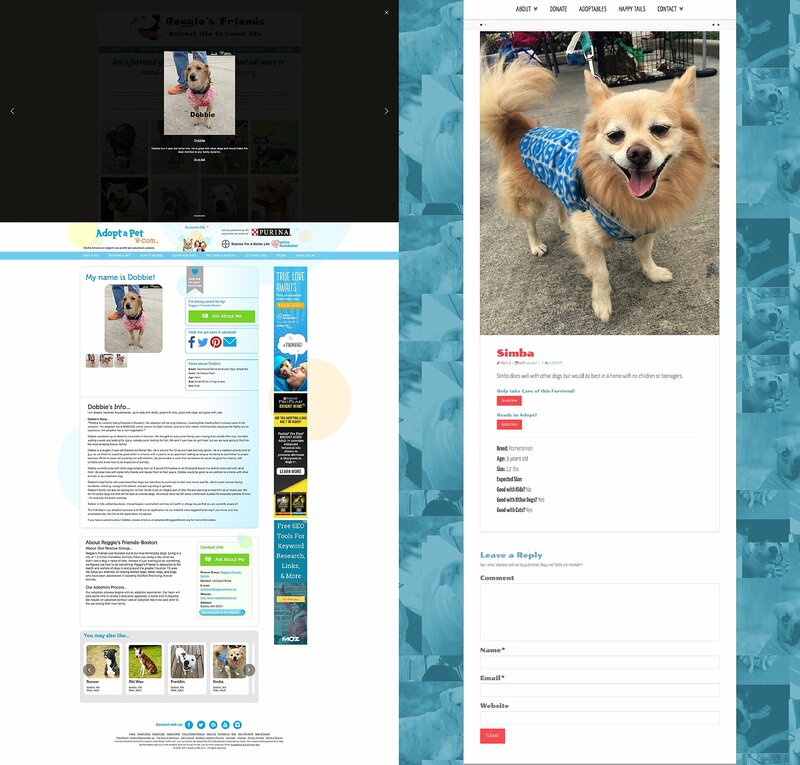 The “Happy Tails & News” section features blog posts and the “Adoptable Furriends” section features dog profiles that display randomly. To add more cute doggies to the mix, there is a live Instagram feed so visitors can see the latest stories despite the app algorithms. Each type of post has a different background color with custom buttons. Reggie is a gorgeous white pitbull, so adding a complete gallery of his most regal and lovable moments was a must. 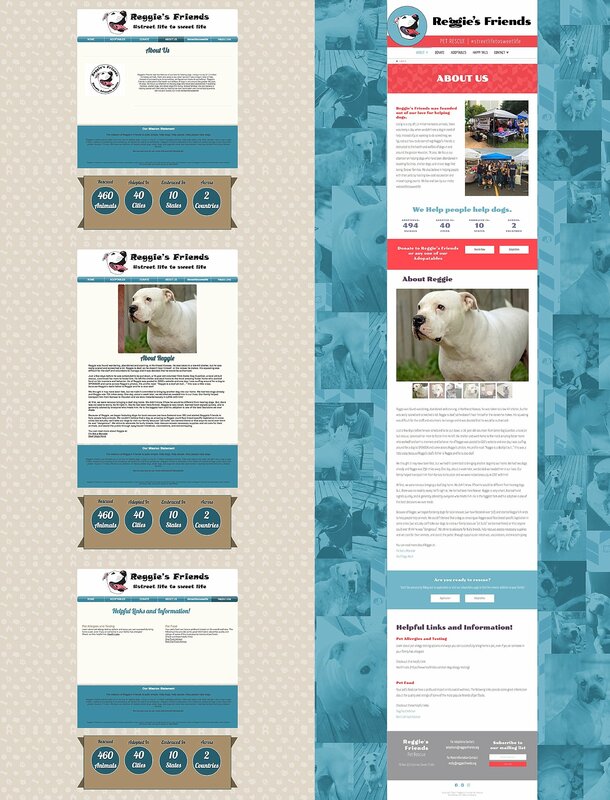 The colorful calls to action (CTAs) on this page speak to the non-profits two main goals: fundraising and adoptions. These pups are the stars of the show! The rescue does a really great job capturing the cutest or most majestic moment with each dog. The top section outlines a few “need-to-knows” in an accordion element with a link to the adoption application. Then it’s onward to the adorable doggies! The list is sortable and each image shows quick reference info for the dogs, including name, breed, age, and weight. Previously, clicking on an adoptable opened a lightbox with a link to more information on a different website. Now the rescue can provide as little or as much information as they like. I created a custom post type for the dog profiles and used custom fields to create an at-a-glance list of info on the dog. From an individual adoptable page, the visitor can go the application or donate to that specific dog using PayPal. One of the things, I love about Reggie’s Friends is that they are very creative with their fundraising. I was really impressed with the list of ways to donate. During the content transfer, Molly made the clever decision to organize the options by direct donations, shopping, and apps. GENIUS! As with all nonprofits, fundraising keeps the lights on and the dogs fed. So it was really important to create as many donation opportunities as possible. Some dogs come into the rescue needing more than just standard care. 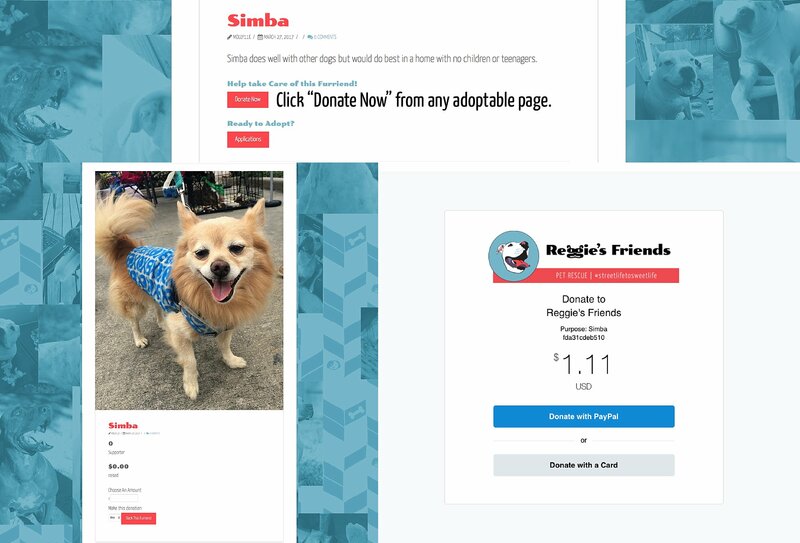 Reggie’s Friends has a strong social media following and can typically find the funds they need to care for these animals by tapping into their network. 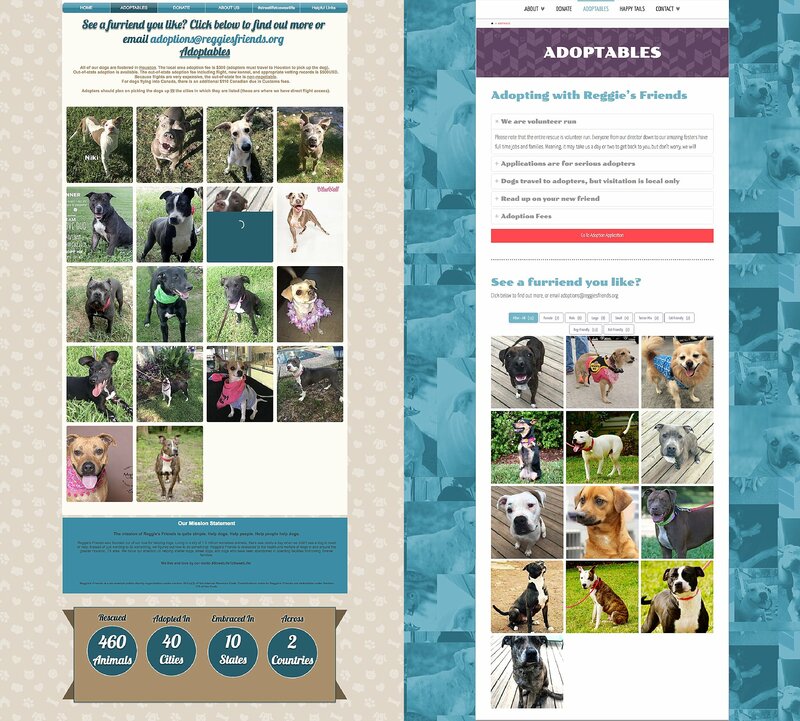 I incorporated a fundraising plugin that allows the rescue to make fundraising pages for individual dogs. This simplifies the donation process and puts it into a branded environment. The blog was another chance to combine pages. The hashtag and the rescue’s motto #streetlifetosweetlife had a page that displayed images of previous adoptables in their new homes. 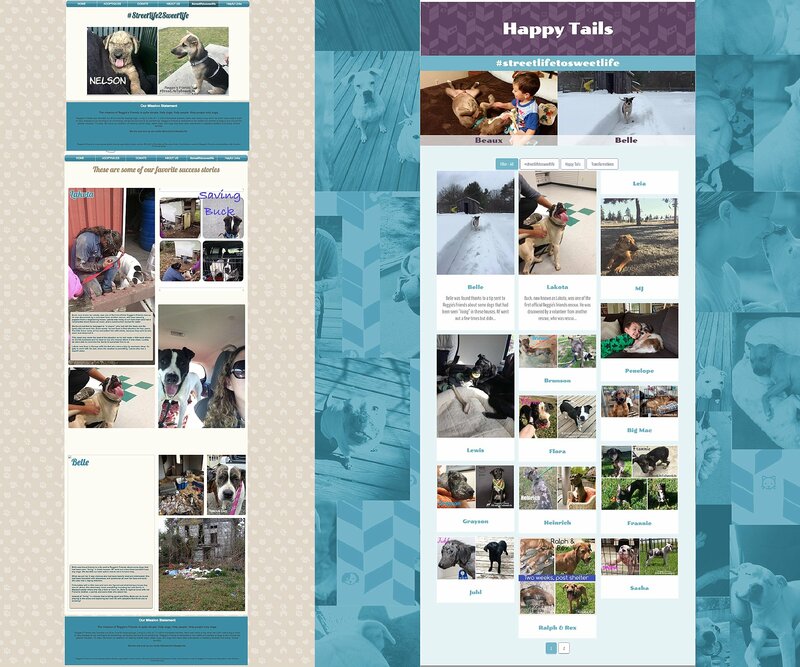 Happy Tails were blog posts of inspiring success stories. Again, two pages, same story—why not make the story stronger by putting them in the same place? I kept the slider and consolidated the posts into a filterable grid. 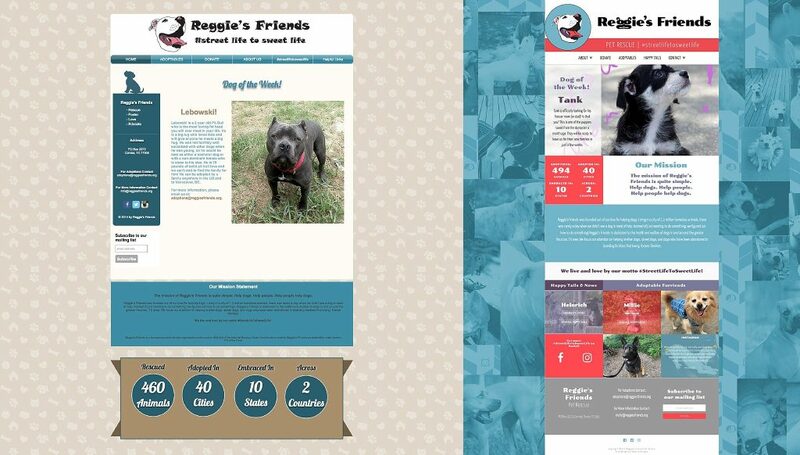 Reggie’s Friends is a great rescue run by great people. I am excited to see how this new brand and website affects their communication with their followers and future adopters. Need a website? Or a Redesign? Request a consultation and get an instant quote today!